GCA Largo Industries, Inc., has generously agreed to donate a Model 5535HZH Skid with SS Cover to the Pressure Washing Resource Assocation (PWRA) as the grand prize giveaway at the 2015 Pressure Washing and Window Cleaning Convention, August 7-8 in Washington, D.C.
GCA Largo is donating the skid and all its components — a $10,870 Value! Since 1987, GCA Largo has been recognized for its quality equipment, which is built in-house from the ground up using only the highest quality components. 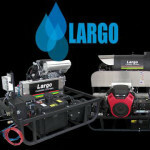 To learn more about all of GCA Largo’s Products, visit their website at www.GCALargo.com.